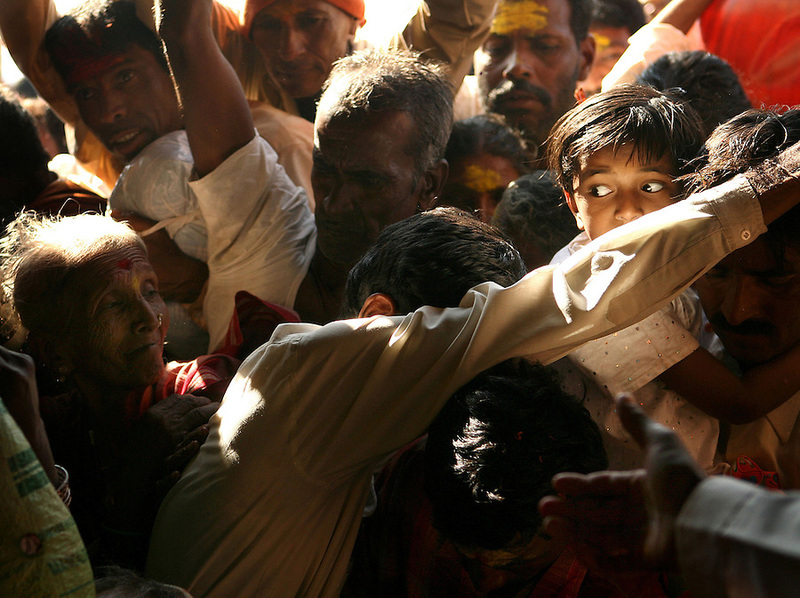 A young girl's frightened eyes are visible amidst the crush of worshippers as her father tries to carry her into the Yellamma Temple in Saundatti, India, on the first day of the Yellamma Jatre (festival). The Yellamma Jatre is an annual gathering of half a million Yellamma pilgrims who converge on the temple to worship the deity. Amongst the rituals performed to appease Yellamma, young girls are dedicated as Devadasi or "temple servants". These young girls are married to the deity and must spend their lives serving the deity which includes catering to the sexual needs of men in the community. They may not marry a mortal and often end up working in brothels in India's urban centers. While the dedication ceremonies used to be performed in public at the Jatre and included parading the young girls naked through the crowds or covered in "neem" leaves, due to the Devadasi Prohibition Act, they are now performed in secret.